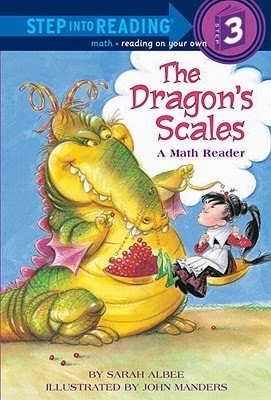 Sarah Albee is one of the most enthusiastic and talented nonfiction writers for children. Her passion comes through in every tweet, blog post, and book she writes. Sarah dropped by Watch. Connect. Read. 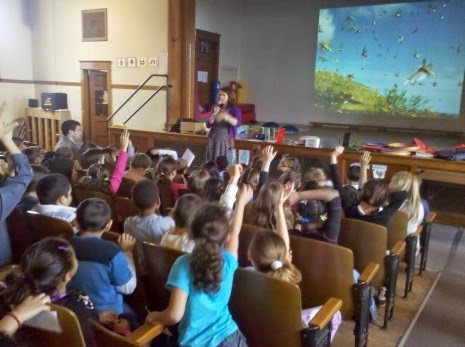 to chat with me about bugs, poop, school libraries, and reading. I wrote the words in red, and she wrote the words in black. Thank you, Sarah! The book trailer for Bugged: How Insects Changed History was a blast to put together. I made it with the help of two talented teenaged filmmakers at my husband’s high school, who filmed it and then helped me edit it. It was fun to find snippets of old footage—mostly from archival government films—and to download different tracks of music from inexpensive stock music archives. Then the kids helped me cobble them together into a creepy soundtrack. On filming day, I couldn’t believe how many kids wanted to eat a cricket. The cricket I ate tasted okay--like a bad potato chip. Architect Mick Pearce built a cool building in Zimbabwe that he modeled after a termite mound. Termites build giant mounds and carefully regulate temperatures inside by constantly opening and closing bug-built heating and cooling vents. The building Pearce designed uses a similar temperature-controlling system. It uses 90 percent less energy than a conventional building of its size. In my book there’s a picture of a termite mound and the Zimbabwe building side-by-side. After you read Bugged: How Insects Changed History I won’t necessarily expect you to love insects as much as I do, but I hope you will at least respect them. When you think about it, we have a lot in common with them. Insects have jobs. They herd other insects the way we herd cattle. They live in well-organized societies. They form relationships. They enslave other insects. They wage war. They take out the garbage, make music, prepare food, and communicate with one another. I also hope people will appreciate the role insects have played in history. They’ve made nations rich and helped create vast empires. They've brought industries to a grinding halt, caused kingdoms to collapse, spread catastrophic epidemics, and conquered armies. ”The Poop talk” is my favorite way to show kids how awesome history can be. I ask them how they think a knight went to the bathroom in a suit of armor, or a lady in a huge hoop dress. And then we’re off and running. Of course, my book Poop Happened: A History of the World from the Bottom Up is not just about poop—it’s about sanitation, hygiene, fashion, architecture, disease, what people ate and drank, and revolutions. Oh, and there’s a whole chapter on insects and the diseases they transmit—which prompted me to write a whole other book! The premise of the Poop book is that societies that paid attention to sanitation were the ones that tended to survive and thrive. 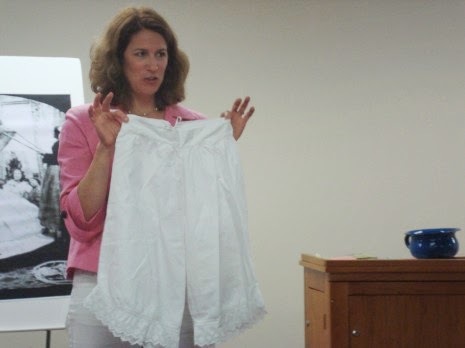 During my school visit talk we discuss how people got from place to place through filthy streets without getting their clothes and shoes muddy or—cough—dirty. (They travelled in sedan chairs.) And how the mounds of garbage and poop dumped outside the walls of medieval Paris became so big, the walls had to be built higher so that besieging armies couldn’t run right up the sides. And how one horrific poop-transmitted disease, cholera, got city officials to finally pay attention to cleaning up the streets and waterways and to build sewers. I realized recently, Mr. Schu, that I keep writing the same book over and over. I am fascinated by the history of everyday life, and by the things that preoccupied ordinary people—what they wore, how they got around, what they did to keep clean (or not), disease-free (or not), and bug-free (or not). My next book, which comes out next year with National Geographic Kids, is about the history of what people wore—crazy stuff like corsets, bound feet, arsenic complexion wafers, lead-filled makeup, ankle-length woolen bathing suits—and why they wore these things. Constance Allen and Sarah Willson are two of my pen names. Constance was my mother’s name, and Allen was my grandmother’s maiden name. Sarah Willson (two Ls) is my married name. I’m also Cassie Waters, Phoebe Rivers, and Belle Payton. I use different pen names because the books I write are so very different—from Sesame Street to SpongeBob to middle grade series fiction with Simon and Schuster such as the Creepover and It Takes Two series. It’s a great day job to have; I’m proud that I can make a good living as a writer. My freelance writing has not just helped pay my kids’ tuition bills but has also been really fun. My basic rule is that I use a pen name when I write for characters I did not create. Recently, though, I have been writing books more and more under my real name. Reading is dangerous. Slave owners banned slaves from learning to read because it gave slaves ideas about freedom and revolting. Oppressive rulers have always feared writers, because their pens have power to change peoples’ minds. Rigidly run societies have denied girls the opportunity to learn to read and write because it gives girls power. Now we live in a world when so many of us—though still by no means everyone—have the opportunity to learn to read, and I try to get kids to see how lucky they are. For me, reading is a precious, open window into a world of infinite possibilities. School libraries are the heart and soul of a school. My elementary school library was in a converted classroom in a very old building. The high shelves blocked most of the light from the windows, and the carpet was worn and bare, and the battered floorboards between the shelves were so uneven your pencil would roll if you dropped it. But it was my favorite place on the planet. I still remember how amazing it smelled—like the well-worn leather of my baseball glove, pencil shavings, and furniture polish. Mr. Schu, you should have asked me about my obsession with insect-themed horror movies. I like to say I write about them because these movies are a good reflection of the relationship humans have had with insects, which is a theme of Bugged. But also, I just like watching them. I review them from time to time on my blog (if you search “Reel Bugs” you’ll find these reviews). I recently did a post about why bugs couldn’t actually grow to thesize of school buses. I am giving away one copy of Bugged: How Insects Changed History. 1. It will run from 4/25 to 11:59 p.m. on 4/27. 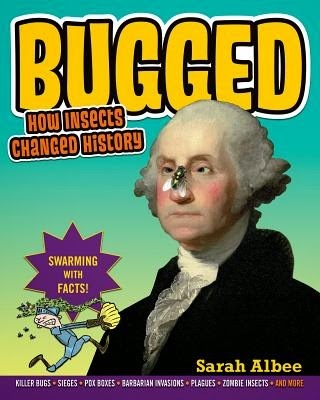 Borrow Bugged: How Insects Changed History from your school or public library. Whenever possible, please support independent bookshops.